The BX-EXT BSX Genuine Leather Welding Glove Extender is a 16-inch bracer used for extending glove length when additional protection is needed. 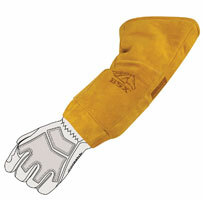 It features an expanded cushioned RestPatch for comfort and can extend the length of any welding glove for added safety. It is made of durable, genuine leather and features wide, snug-fitting elastic.